Labor Day usually is the unofficial end to summer. Kids are dreading the return to the classroom – and the school bus – and they’re definitely not looking forward the shorter days. The past few years have proven especially difficult for millions of families from a financial perspective. There are a few things that can help offset those expenses – if you know where to look. Choosing the right credit card is your first best move to keeping expenses down. You an easily find offers that have no annual fees, low or no APR rates, cash back bonuses and even tools to help high school and college students in their quest for responsible financial choices. A bit of research and making choices based on the rewards that will best suit your needs is the way to go. One look at the statistics tells the tale. Back to school is not pleasant nor cheap. Did you know Americans spent close to $7.4 billion in 2010 on all the back to school necessities like book bags, clothes and even cell phones? It’s true and if you have a kid headed off to college, expect to spend even more and their tastes become more expensive and the cars they drive must be insured. The U.S. Census Bureau reported 55 million kids in classrooms from kindergarten to high schools. Since school is but a few weeks away, we thought it’d be a great time to review credit cards rewards and how they might affect your bottom line. Keep the kiddies looking great and your credit card balance, too. This choice catches your eye with the absence of an annual fee as well as an intro APR for the first year. Enjoy a 3% rebate when you purchase gas and pay at the pump, too. 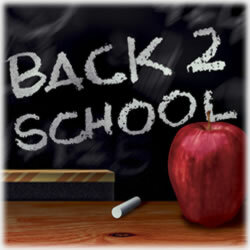 Grocery shopping and back to school shopping earns 2% cash back, too. All other purchases earn you 1% in cash back. While there are no bonus cash back categories, many consumers appreciate the straight forward program that lets them know exactly how much they’re earning. The Visa Chase Freedom is always a smart choice for parents. With the quarterly bonuses, card holders earn impressive returns in certain categories. There are always opportunities to earn cash back, including your first transactions that total $500 during the first ninety days earns $200 cash back. Also, shop shop through the Chase network and earn even more. In fact, this is one of the more popular online “malls” the credit card companies offer. Your points never expire, either and there’s no annual fee. The classic favorite, this credit card has found the winning formula for customer satisfaction. From a “live” voice answering calls to the popular process of redeeming rewards points, Discover has truly carved its own niche in this particular sector. For parents sending kids off to college, it’s a double bonus as you can add another card at no additional cost. This often is a great solution for families who don’t necessarily want to open another credit card account for their young adults, but they want to ensure the bases are covered. The absence of rewards redemption fees are a nice bonus, too. Currently, there’s an intro 0% APR for both purchases and balance transfers, no annual fee and an easy to navigate online account manager program makes it perfect for many reasons. This credit card offers 5% cash back in categories college students typically flock to: gas stations, fast food (and the healthier choices, too) restaurants, grocery stores and department stores. Students earn 1% cash back on all other purchases. It’s reserved exclusively for students enrolled in college and when applying, proof of enrollment must be supplied. This is required due to the lower late fees and other benefits that are designed for the college student. There is no annual fee associated with the Discover Mix Tape, either. It’s a viable option for any college student and certainly worth the consideration of his parents. Whether the thought of the kids going back to school is a welcomed fact or if you’re going into it with bittersweet memories of another summer’s that’s fading, one thing you don’t have to do is let it drain your wallet. There are always great offers associated with any number of credit cards.